No matter how trained your beloved pet is, there are chances of it getting the carpets and rugs wet once in a while. Sometimes it can be quite irritating but let not these trivial issues take away your puppy love. Stay calm and learn how to clean dog pee off carpet. Below you can find everything you need to know when you are dealing with a dog urine stain. After testing different homemade tips as well as commercial cleaners we found best results with Simple Solution Pet Stain Remover. It helped me remove even the toughest urine stains as well as the bad smell. Works on dated stains as well. Definitely worth checking out! First of all, soak up excess urine from the carpet as soon as possible. You can use some cotton cloth or paper towels for blotting the additional moisture. Just cover the urine patch with a towel and press it hard with a heavy object. Pressing it with some old or disposable item like an old shoe, brick or a non-functional press can be a better option. Dispose of the soaked paper towel and repeat the process with fresh ones as many times as required to dry up the stained area. Mix white vinegar with water in a bowl in equal proportions. Prepare enough quantity of mixture required to work on the affected area. Apply the water-vinegar solution evenly on the stained patch. Rub the spot thoroughly with a scrubbing brush. Take care of the carpet’s fabric while scrubbing it. Vinegar in the mixture will help to counteract against the ammonia present in the urine. Now blot the vinegar water solution using paper towels in the same way as you had soaked up the excess urine from the carpet. Once the carpet is totally dry, sprinkle one to two small quantities of baking soda on the stain (depending on the stain size). Now apply a half cup mixture of three percent hydrogen peroxide and a teaspoon of liquid dishwashing detergent on the stain. If required, you can rub the carpet again with the scrubbing brush. Leave the carpet for sometimes to dry completely, and then clean it with a vacuum cleaner. 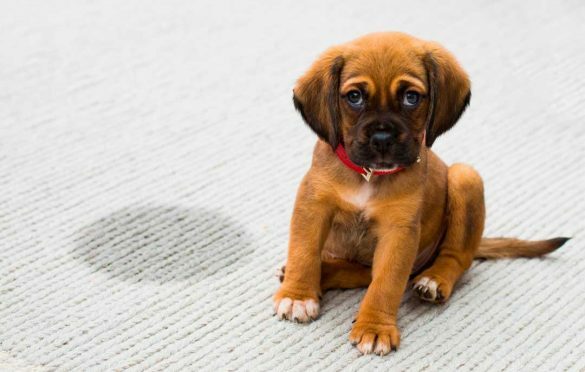 Baking soda and white vinegar will definitely help you clean the dog pee off your carpet. Hydrogen peroxide is a must-have multitasking agent in every household. And now you can create your own specialized stain remover using liquid dishwashing soap and hydrogen peroxide that will help you clean dog pee off your carpets. First of all, sprinkle some baking soda on the urine stain. Then stir up a tablespoon of dish cleanser with a cup of hydrogen peroxide in a spray bottle. Shake the mixture gently. Then spray it on the stained area where you had sprinkled baking soda earlier. With the help of a scrubbing brush or a discarded toothbrush rub the blend delicately into the carpet and then leave it to dry. Once completely dry, vacuum cleans the area. After that clean the carpet with cold water. Note: As hydrogen peroxide is a mild bleaching agent, it can cause harm to some types of carpet fabrics. Before applying on the carpet, please make sure to conduct a spot test of the cleaning mixture on a non-significant area on the same carpet. If you have pets at home but don’t have much time for treating the stains caused by them, you don’t need to worry at all. Enjoy the companionship of your loved ones and let the experts take care of the rest. There is a range of products available on the market, some specially designed to combat the foul odor and tough stains caused be dog’s pee on the carpet. You don’t even need to hunt for the best options, here’s a list of the Best carpet cleaners for dog urine. You have worked hard to clean your house but the stink has not gone away? Some carpet powders have been specially designed for homes with pets. Sprinkle it on the carpet and follow the instructions written on the packaging. After allowing it to sit on the carpet for the required time, clean the carpet thoroughly using a vacuum cleaner twice. The first time, the vacuum will remove the powder and topical particles from the carpet. You will need to repeat the process a little bit slower so that hair, dander and other particles that are sitting deeper onto the fibers get removed. If you are skeptical about the side effects of deodorizer on your beloved pup, we are here to take your worries away. The Furriest Friends Carpet and Room Deodorizer, which uses a formula prepared from corn cob grindings, is as safe for your pet as it is for your kids. it is easy to use and will surely result in a happy pet, clean carpet and happy you! Click here to check the current price on Amazon. If you have troubles with poop stains as well, find more information here. It’s a well-established fact that prevention is always better than cure. Why indulge yourself repeatedly in the lengthy process of removing dog’s pee from the carpet when you can prevent it altogether! There are many commercial repellents available on the market such as sprays which will keep your pet away from the desired area. Some repellents are made of chemicals and some of them contain naturals like cayenne pepper. Simply spray the repellent in those areas you want to keep your pet away from. Dogs don’t like the smell of these repellents and it’s very unlikely that they will go into the area where it has been used. The Four Paws Indoor Outdoor Repellent keeps your dog away from the designated area without causing any harm to the dog, you or your family. The only small drawback of this repellent is that it works for a short span of 24hrs only, and you have to use the product repeatedly. But again, it is far safer than the other similar products available in the market. Click here to check the current price on Amazon. White vinegar also works as a dog repellent. Mix water and white vinegar in equal proportions and spray it on the areas and carpets where your dog often urinates. Dogs hate the odor of acetic acid, so they won’t return into the areas treated with the solution. Dogs hate the smell of citrus fruits also. So you can also mix some lemon juice in water and spray the mixture on your carpets. While for us the fragrance might be refreshing, dogs won’t like it. Citric acid can also be used effectively to remove urine odor and clean it from carpets. One more very effective technique to keep your pet away from the carpet is to use alcohol. Dogs don’t like the strong smell of alcohol. So you can also use a solution containing alcohol and water in equal quantities as a repellent. Alcohol, also known as isopropyl alcohol, possesses disinfectant and antibacterial properties. Reapply the mixture as required. Highly alkaline in nature, ammonia should never be used on carpets. In addition to damaging the fabric, ammonia will add a sticky residue on the carpet creating more mess on the soiled area. Some uric acids and salts that are present in urine are present in ammonia. So in place of deterring, the odor of it also attracts pets back to the same area. Stubborn stains need more vigorous treatment. Steam cleaning is the best way to remove the dog’s pee off the carpet in case of old stains. Click this link if you want to read our review of the Hoover Power Scrub Deluxe. Always remember to dispose of or clean properly any tool used for removing dog’s pee off the carpet. Otherwise, the odor of urine may invite the dog to urinate again and you will have to clean dog pee stains again. Avoid walking on any damp areas of carpet. Never use enzyme cleaners on woolen or silk fabric carpets as the enzyme cleaners can damage them. If none of these tips work you can always try a commercial product. Here you can read which are our top-rated cleaners for dog urine. I found your tips really useful. Thanks for them.